This video documents the challenges that climate change presents for four specific Arctic predators: polar bears, Arctic foxes, beluga whales, and walruses. This interactive shows the extent of the killing of lodgepole pine trees in western Canada. The spread of pine beetle throughout British Columbia has devastated the lodgepole pine forests there. 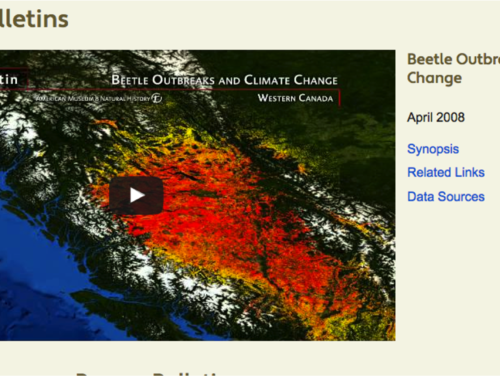 This animation shows the spread of the beetle and the increasing numbers of trees affected from 1999-2008 and predicts the spread up until 2015.